The ESPinator is an online tool designed to help companies find the Email Service Provider (ESP) that best suits their needs. When answered completely, it can be used in place of a lengthy RFP process. Or, it can be used to generate a shortlist for a RFP. Users answer a series of questions --over 150 in all-- on what they are looking for from an ESP. Each question is answered on a 1-5 scale based on level of importance. The ESPinator will then rank the ESPs according to the responses and display the top three matches. Why did you build the ESPinator? In the ESP space, it has become increasingly difficult for marketers to sift through the ocean of competing marketing claims. The ESPinator looks at the actual capabilities of ESPs, compares them with your needs, and generates actionable results. How many ESPs are in the ESPinator? There are over 30 ESPs in the ESPinator. Some examples include: Acxiom, dotMailer, e-Dialog, Maropost, SFMC, Responsys, Vertical Response, WhatCounts, and Yesmail. How do you score the ESPs in the ESPinator? A team of experts with deep knowledge of the specific ESPs analyzed each ESP on over 150 criterion, and added their professional opinion on the subjective areas, making their views considered analysis, not bias. Who built the ESPinator and assembled the experts? 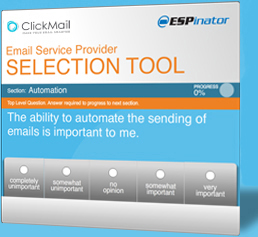 ClickMail Marketing, a widely respected email marketing company, designed and built the ESPinator. The raters and analysts either work for, or were recruited by, ClickMail. Can I trust the ESPinator? Clickmail Marketing is assiduously vendor-neutral and is partnered with far too many ESPs to take sides. Do I have to buy from ClickMail? No, but you're welcome to do so.